The Milpitas Unified School District is located in the City of Milpitas, California. The City of Milpitas is situated in the northeastern corner of the world famous Silicon Valley. The City is nestled between San Jose in the south and Fremont in the north. ﻿The Milpitas Grammar School on Main Street (now part of the City of Milpitas Library) served the educational needs of the majority of citizens of Milpitas from about 1912 to 1956. 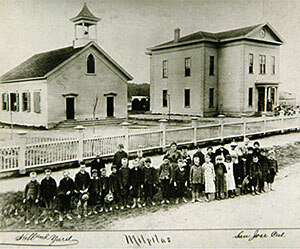 Prior to 1912, Milpitas children received their education from three different schoolhouses – Air Point School, The Calaveras School, and a schoolhouse built and shared by the Presbyterian Church. In March of 1956, the District welcomed Joseph Weller Elementary School for its first school. Weller Elementary School was originally Sunnyhills Elementary School. It was followed by Anthony Spangler Elementary School, formally called Milpitas Elementary School, which opened in September 1956. In March 1959 Alexander Rose Elementary School, formerly known as Milford Village School, opened followed by Thomas Russell Middle School, which opened its doors in October 1961. Gertude Abel Elementary School opened in January 1962, followed by William Burnett Elementary School in September 1963 and Curtner Elementary School in April 1964. In 1965, Robert Randall Elementary School opened and was named after the District’s first Superintendent, Robert Randall who passed away at the very young age of 39. Martin Murphy Elementary School was next to open in November 1966, followed by Marshall Pomeroy Elementary and Rancho Milpitas Middle School, which both opened in November 1967. The last two schools to open were John Sinnott Elementary School in 1968 and Pearl Zanker Elementary School in September 1969. In December 1968, the community voted for unification, making the schools a part of the Milpitas Unified School District. It included Samuel Ayer High School, which was built in September 1956 and Milpitas High School which was built in 1970. Air Point School was incorporated into the District. The school, which was originally built in 1903, was rebuilt and re-opened in 1966. Abel Elementary School was eventually closed in 1978, and Murphy Elementary School was closed in 1983. Both of these school sites are currently being leased by the District. Samuel Ayer High School was closed in 1980. The District’s Community Day School occupied the Air Point site until June 2009. The site now houses the District’s Independent Study Program. Milpitas Unified is a growing early childhood through adult education award-winning school district with high academic standards and an innovative learning environment. The student population of more than 10,200 is rich in ethnic and cultural diversity, with more than 50 different languages and dialects spoken. The student ethnic distribution is 50% Asian, 20% Hispanic, 17% Filipino, 5% White, 2% Black, and 6% other. The District is comprised of 10 elementary schools (Burnett, Curtner, Mattos, Pomeroy, Randall, Rose, Sinnott, Spangler, Weller, and Zanker), two middle schools (Rancho and Russell), and one comprehensive high school (Milpitas High School) a continuation high school (Calaveras Hills High School), a Child Development Center (Rose Center and Sunnyhills Center), and Adult Education facilities at Ayer and Santa Clara County Dept. of Corrections. It has an annual budget of approximately $126 million in the general fund and $145 million districtwide, and nearly 941 employees. Milpitas Unified School District is a high performing school district. The new California School Dashboard provides parents and educators with meaningful information on school and district progress so we can participate in decisions to improve student learning. Based on a color system, with blue being the highest and going down from yellow to orange to red, Milpitas Unified is in the blue zone for its graduation rate and English language arts scores, not falling far behind, in green, with college/career and mathematics. There are orange and red areas in chronic absenteeism and suspensions. To take a deeper diver of the data, visit the website here.